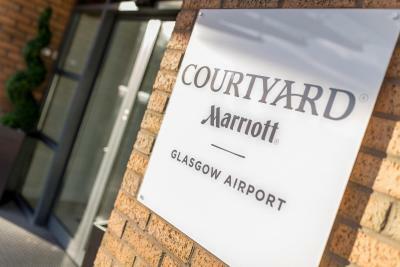 Lock in a great price for Courtyard by Marriott Glasgow Airport - rated 8.9 by recent guests. Right next to a diner which had very good food. Rooms had good facilities, fridge, coffee etc. Location was good for us as we had been in Yosemite all day and were leaving. 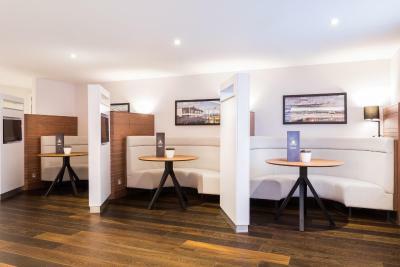 Reasonable chain hotel located within walking distance of Glasgow Airport with comfortable and quiet rooms. Fine for an overnight stay if you are flying in or out of the airport. 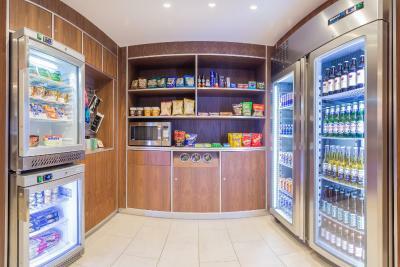 The food was typical average chain hotel fare, fine to keep a person going when staying overnight if you don't want to go out for dinner or breakfast. 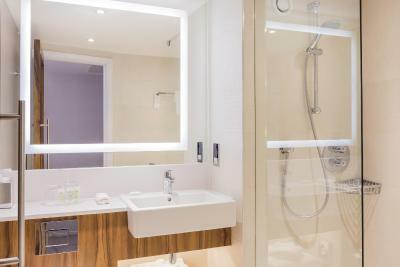 The room was spacy and so was the bathroom. The room had a kettle and set of tees/coffee to make. 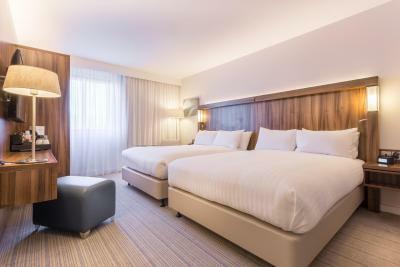 Modern, spacious bedrooms. Very clean and comfortable. Rooms were beautiful ; such a pleasant nights sleep! Beds were so comfy, decor really nice and double room a nice size. 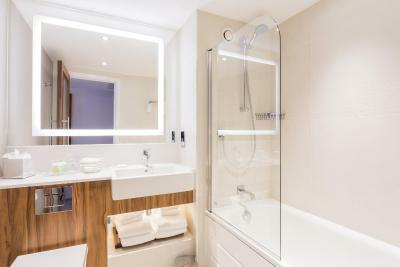 Wet room in bathroom - shower was excellent! Check out time of 12pm was also appreciated after our travelling the day before. Nick on reception was so friendly and helpful! 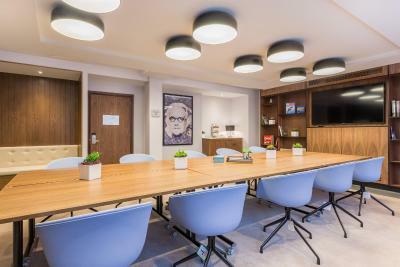 Location- 5 minutes walk to the airport, size of rooms, reduced price for pre-booking a parking space. 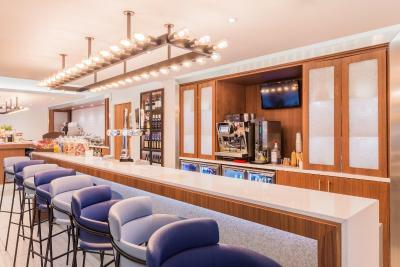 One of our top picks in Paisley.Located just off the M8 motorway and only 550 yards from Glasgow Airport, the modern Courtyard by Marriott Glasgow Airport offers free WiFi in public areas. Both the Emirates Arena and Sir Chris Hoy Velodrome are 13 minutes' drive from the hotel. 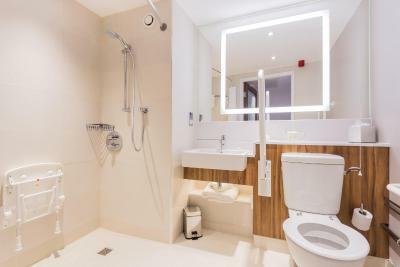 Every room comes with a private bathroom featuring a shower and hairdryer. They also all include a flat-screen TV, safety deposit box, refrigerator, ironing facilities and free tea and coffee. 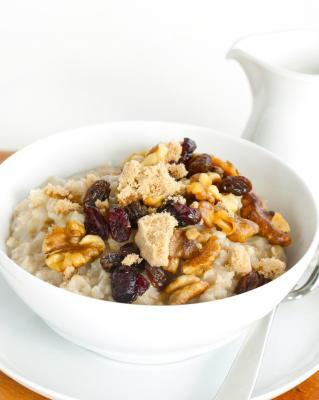 The Bistro is a stylish restaurant offering breakfast, lunch and evening meals, as well as an evening bar. 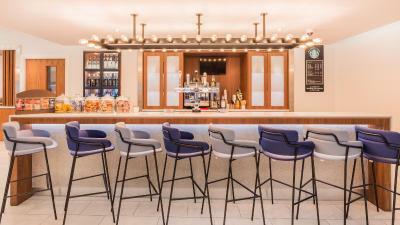 The Market lobby bar is open 24 hours and offers snacks and chilled beverages. 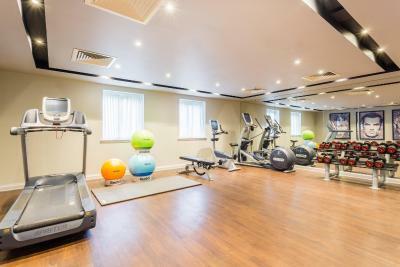 Guests can enjoy the fitness centre, featuring a range of cardiovascular and free weight equipment. Glasgow Central Rail Station is just a 15-minute drive away, whilst Paisley Gilmour Street Station is only 6 minutes’ drive. 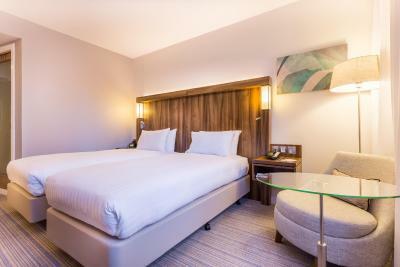 The Scottish Exhibition and Conference Centre (SECC), is a 10-minute drive from Courtyard by Marriott Glasgow Airport. Long-stay parking is available, at the hotel or in secure parking by the airport. The Hydro Arena is a 10-minute drive from the property. 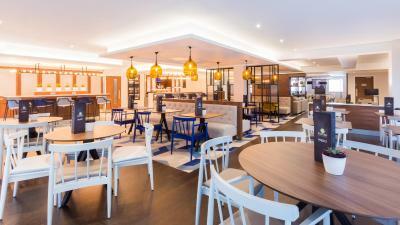 Courtyard by Marriott Glasgow Airport has been welcoming Booking.com guests since 1 Aug 2005. 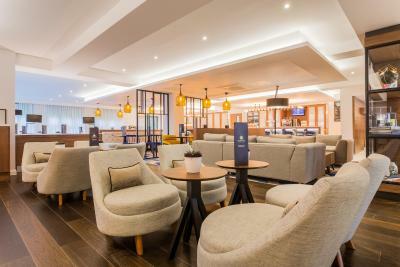 When would you like to stay at Courtyard by Marriott Glasgow Airport? 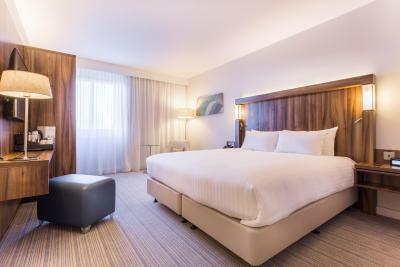 This room has a King bed or 2 single beds with pillow top mattress, featherbed and duvet, air conditioning, chair and desk, Bluetooth alarm clock, in-room safe and refrigerator, hairdryer, iron and ironing board, WiFi and a 43-inch LCD TV. Private parking is possible on site (reservation is not possible) and costs GBP 7 per day. 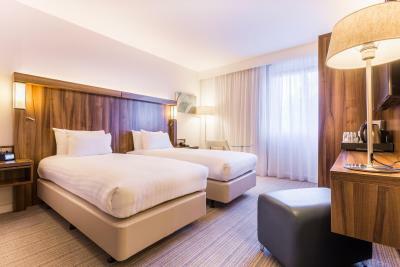 This room has 2 double beds with pillow top mattress, featherbed and duvet, air conditioning, chair and desk, Bluetooth alarm clock, in-room safe and refrigerator, hairdryer, iron and ironing board, WiFi and a 43-inch LCD TV. 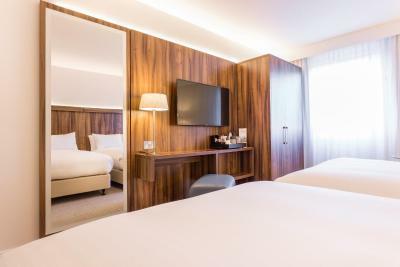 This room features a featherbed and duvet, air conditioning, a chair and a desk, a Bluetooth alarm clock, an in-room safe and a refrigerator, a hairdryer, iron and ironing board, Wi-Fi and a TV. 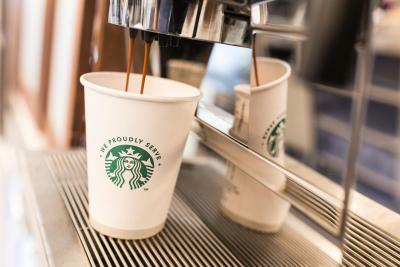 The room also includes water, a newspaper, a snack, a soft drink, 2 Starbucks Coffee vouchers and an upgraded breakfast item. 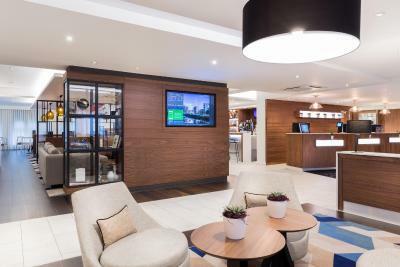 House rules Courtyard by Marriott Glasgow Airport takes special requests - add in the next step! 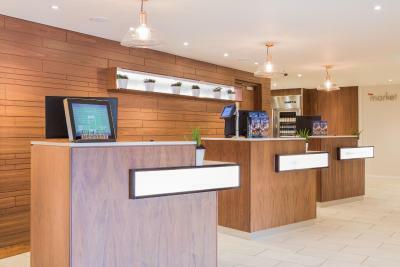 Courtyard by Marriott Glasgow Airport accepts these cards and reserves the right to temporarily hold an amount prior to arrival. 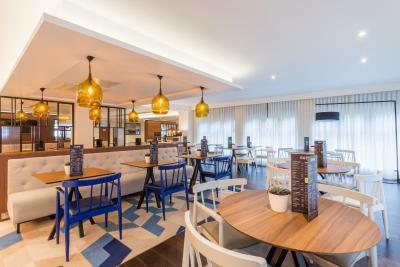 Breakfast is served: 7 days per week with Continental breakfast served from 06:00 until 10:00 and full breakfast served from 05:00 until 10:00. Please note that long-stay parking is available at the hotel or in a secure carpark near to the airport at an additional cost. Car Park is chargeable at GBP 10 per night. There is a designated footpath from the hotel to the airport. Breakfast was not included for adults and was quite expensive. 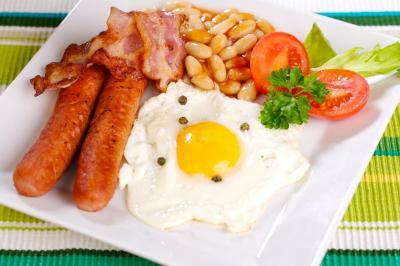 The breakfast was very tasty and more than sufficient. Is pretty far our from Yosemite, wouldn't be good as a base if you were going for multiple days and no shops near by. Location is good and the hotel is very welcoming. Needed to pay for parking. Parking costs 10 pounds overnight, be aware of this. Incident: When we stayed the night, somebody in the hotel decided it was a good idea to smoke indoors which led to that the entire hotel’s smoke alarms went off. This woke us up at 5 am in the morning. Staff was not proactively apologetic about this. Charge for parking of £10. TV was very dull and couldn't access settings to adjust. Signage from the airport starts off with clear signs but a left turn through the car parks just after the Holiday Inn Express hotel which would bring you to the Courtyard is not signposted. This isn't helped by Google Maps giving a route which brings you to a busy roundabout where the footpaths reach a dead end. It took me over 20 minutes to get to the hotel and I saw a cabin crew wandering around looking lost at the same time and they eventually arrived at the hotel after me. Walking back in the morning when I knew where to go took less than 10 minutes. When i made the booking, i chose the king sized bed, on arrival, i was given a room with 2 single beds.